This artful Friday isn’t from my class. Due to the Olympics being here, my classes won’t start until another two weeks. 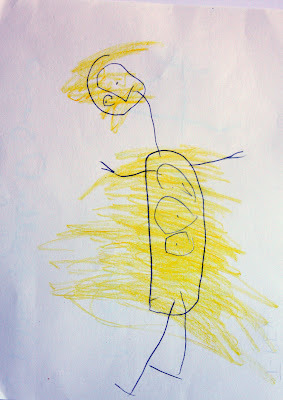 This art however is from my 4 year old. It’s a T-Rex. Not his finest, I’d say, but it was his choice. I would like to see something more from him, but that’s the mom/teacher in me. The nurturing mom, needs to let him do what he feels is best. After all its just for some Dino feet. There will be a day when I will cross that line, when to push him to do his best and when to learn to let him find his way. I’m glad I have a few more years before I reach that. 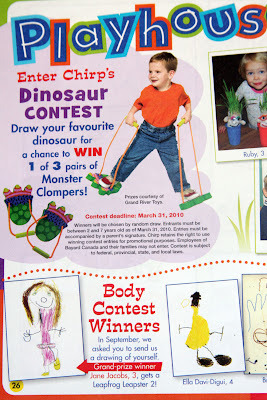 I think he was rushing because he drew it for this: It’s a contest to win the dinosaur feet the little boys in the pictures has on. It’s a bit exciting because when I was reading the magazine to him, he was the one who wanted to enter to win. It’s his first art contest. 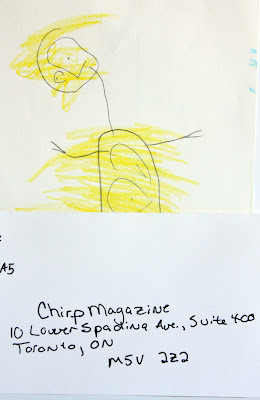 Chirp Magazine is a great starter for little ones. It’s educational and always has fun things to do on the inside. When I saw Dino’s on the cover, I knew it would be coming home with us. It’s also really fun for him because we are sending snail mail. So he got to pick an envelope, put a stamp on, and he was extra proud to hand it over at the post office. The hand writing there, that’s actually mine, not his. It may look like a 4 year old writing, but yea, it’s mine. I remember my sisters and cousins siting around practicing there names and writing. Me, no thanks, I would tie my red wagon to the back of my bike and take off through the hood. Hope you have a happy Friday and find a little adventure this weekend.